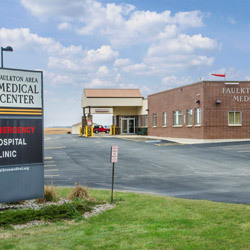 The Faulkton Area Medical Center provides a broad range of services and programs to a population of over 2,600 in Faulkton and the surrounding county. FAMC serves as a magnet for residents of the surrounding area with many patients driving miles to receive specialty services. Physicians, mid-levels, and professional staff are on call 24-hours per day, providing ambulance service, diagnostic lab and x-ray service, emergency service, and acute care. Like many rural areas across the U.S., as the population density is decreasing and our citizens become increasingly older, we see a growing need for specialty medical services including home care, cardiology, oncology, therapy, rehabilitation, and various wellness programs. 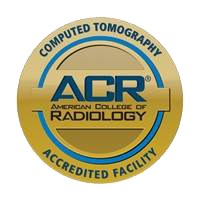 FAMC always strives to meet the needs of area residents with the best care possible. No one will be denied access to services at FAMC due to inability to pay. The history of the Faulk County Hospital/Clinic cannot be told without mentioning Dr. Abbie Ann Jarvis. Dr. Jarvis came to Faulkton in the winter of 1888-89 where her father was the local physician. 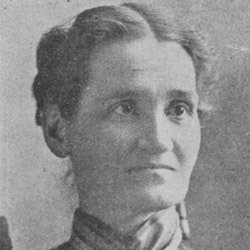 Though not Faulkton’s first practicing physician, Dr. Jarvis had the distinction, in 1898, of being the first woman licensed to practice medicine in the state of South Dakota. She was also the state’s first registered pharmacist in 1895 and had a pharmacy in Faulkton. In 1917, Providence Hospital opened in Faulkton, fulfilling her lifelong dream of providing health care to the people of Faulkton in a hospital setting. Dr. Jarvis raised her family and practiced pharmacy and medicine in Faulkton and the surrounding area, almost to the time of her death in May 1931. Enhanced through the efforts of Dr. Jarvis, quality health care in Faulkton has a strong history. From 1917 to 1951, patients were cared for in a frame building that was on the same lot as the past Faulkton Medical Clinic. Due to untiring efforts of the Faulk County Commissioners, a new brick structure was contracted in 1949 and opened to patients in 1951. Funds to build this hospital were secured through a bond issue and Hill-Burton funds. In 1966, a large addition and remodeling project was accomplished through another bond issue and the use of Hill-Burton funds. With the completion of the addition-remodel project in 1968 the Faulk County Memorial Hospital became a modern, 34-bed facility. In 1983, the hospital was leased by Presentation Health System. In 1984, the hospital entered a management agreement with Presentation Health System, later know as Avera, and it continued until the fall of 1993 when the facility again became independent. In May 1992, a new clinic opened for business. This clinic was separately incorporated and separately funded. For ease of patient care and delivery of health services, the clinic was physically attached to the existing hospital. In September 1993, FCMH was certified as the first Rural Primary Care Hospital in the nation. 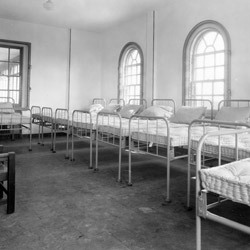 The hospital was licensed for six acute care and six swing beds. 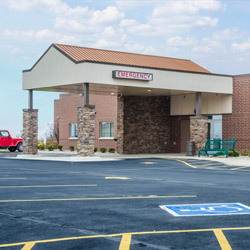 In 2006, Faulk County Memorial Hospital and Medical Clinic became one of 32 facilities in the nation to build a completely new facility. FCMH/C was the only institution in South Dakota to receive funding through a combination of loans and grants. With the move in June 2007 into the new facility located on the southwest edge of Faulkton, all related health facilities were physically joined. The Faulkton Area Medical Center (hospital & clinic) is connected by a hallway to The Meadows (assisted living) and the Faulkton Health care Center (nursing home). The medical center continues to be governed by an independent, local board of directors. The nursing home and assisted living facility are operated by a private corporation.